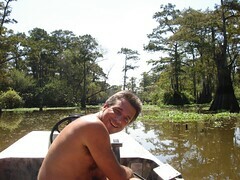 Hurricane Gustav hit the Atchafalaya Basin very hard. 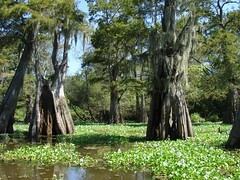 Cypress forests are hurricane resistant and hurricanes are actually good for the health of cypress swamps because high winds knocks down “trash trees.” The Atchafalaya’s fish and hardwood forests are not as lucky. 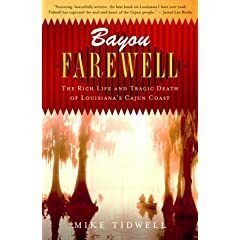 Millions of fish died after the hurricane and it will take years for the Atchafalaya Basin’s fish populations to recover. Oh, and speaking of books. 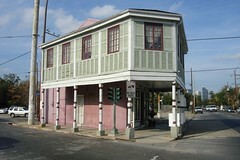 James Lee Burke‘s detective Robicheaux operates in Louisiana. 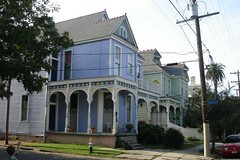 This one takes place in the aftermath of Katrina. Both the description of the devastation after the hurricane and the plot are fantastic. Egrets, ibises, wood storks, great blue herons, little blue herons, spoonbills and anhingas are feasting on the fish, which have sought refuge here. Photo by basinkeeper Dean Wilson. Above photo also by Dean. 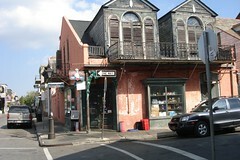 When we left New Orleans in September we vowed to come back towards the end of our trip. At that time it was difficult to say whether we were crazy about the place because we’d just arrived in the South and everything was new and exotic, or if the city really was as special as we thought at the time. And after 22 states – yes, it really is that special! We decided to try out some very touristy things, because our trusted guide book recommended it and because Dane really wanted to. 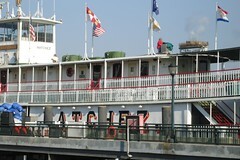 So on our first day, we went on a two hour river cruise on the Steamboat Natchez. A very lovely experience that didn’t feel like a rip-off at all. 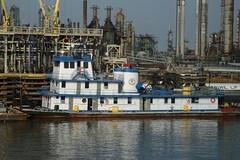 The Mississippi really is mighty and sailing on her was something special. 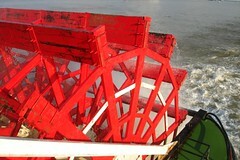 And on a steamboat. 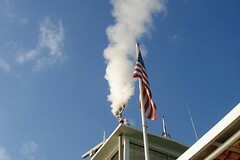 Even if that steamboat was only built in 1978. You should have heard the steampipe organ. It is WAY beyond description! Next on the touristy agenda was a ride with a mule buggy. 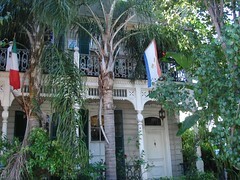 We were rather lucky with the driver – he was of Irish descent, but his accent was pure New Orleans – through and through. Dane claimed not to have understood one word he said. And he said a lot! And let Dane drive the mule. 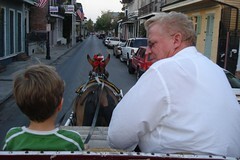 He (Dane, that is) was so proud and never realized that the mule knew it’s way through the French Quarter better than most. And also knew to stop at the lights! The driver told one dirty Irish joke after another – among lots of both interesting and juicy (but not necessarily true) anecdotes about New Orleans. 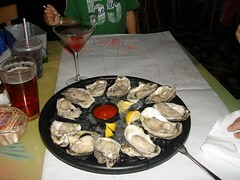 After that we were ready for some food and chose the much recommended Acme Oyster House. Even if it had a queue outside, we were inside in a few minutes. The food was very good – particularly the chargrilled oysters. Mmmmm. But the service. It was super quick – we’d hardly sat down before the waitress was all over us to make up our minds NOW. And the oysters were on the table in a couple of minutes. But – unfortunately – so were our main courses. Which of course meant that the main courses got cold before we could get around to them. And the noise level! Quite stressfull dining experience – in spite of the lovely food at very fair prices. The black cab driver who took us home was a man who knew how to multi-task. He was on his cell having a very serious discussion with his wife about their finances. And he was discussing with the dispatch about his next ride. And explaining stuff to us. The radio was on too. All this besides driving… But he got us home safely and quickly. The next day we decided to venture into town (campground is 6 miles west of downtown) by way of public transportation. That’s another first on this trip. So we went across the street to the bus stop. Very soon an elderly black man came, lugging a huge carry-all. He spoke in the dialect I’ve read that the slaves spoke. He said: “Y’all gotta ax the driver”. He was mighty friendly though. Well on board the bus we were approached by a number of more or less strange characters, both blacks and whites. But they were all extremely kind and helpful. 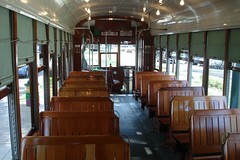 We changed from the bus over to the newly reinstated St. Charles streetcar. That was a wonderful experience. 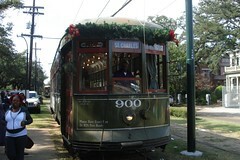 The streetcar has only been back in action (after Katrina) for a few weeks. When we were in New Orleans last time, it wasn’t running. 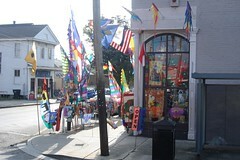 We got off in the Garden District because we wanted to revisit the wonderful flag-shop we visited the last time we were there. Last time Dane got a wind spinner depicting a helicopter, but unfortunately – and the cause of much crying – he forgot it hanging from a tree in Savannah. This time we got two… And a long chat with Brad & Dellwen, the two ageing chaps who run the shop together. They certainly were characters too. Dellwen showed me what Brad had brought back with him after having left him to hike in Alaska for several weeks: A big gold ring, studded with diamonds. So sweet! 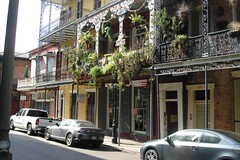 We jumped back on the streetcar and continued to the French Quarter again. We’d decided to have a proper meal for once, so had checked out the Zagat guide to restaurants. We’d chosen one and also been in there earlier to book a table. When we came back to claim it, the snotty hostess told us we couldn’t get in, because David was wearing shorts. They could have told us that the first time round, we thought! We trodded on, wondering what to do, because Dane was getting tired. On the way David had the good fortune of being shat on by a pigeon. At the time he didn’t appreciate it at all and was swearing a good deal… But just around the corner was a restaurant with a beautiful courtyard where people were dining. That was exactly what David had been longing for. Sitting outside among palm trees and having a lovely meal. They didn’t mind the shorts or the six-year-old, so we got a table in a corner by a little fountain. 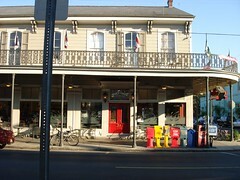 In Zagat we read (under the table) that this was one of New Orleans’ top restaurants, Bayona. What amazing luck! David now blessed the pigeon rather than cursed it. We had lovely food and a really, really nice evening. 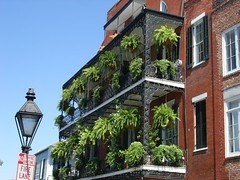 It was expensive for New Orleans, but not at all compared to Copenhagen or London. Just this one example: I had a glass of a wonderful late harvest with my coffee, a wine I’ve tasted before. Reason I remember it, is that it shares it’s name with my brother. It cost 5$ for a glass. 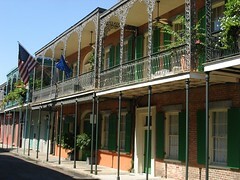 New Orleans, we will be back! More pictures and bigger versions here. 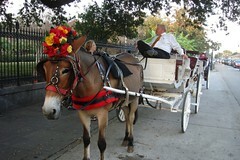 Our camp offered a free shuttle bus to downtown New Orleans at 9 o’clock. The driver also took it upon himself to tell us more or less everything about every little house or ditch we passed on the half hour drive. You get the impression that these guys are paid on a words-pr-minute basis. Were they paid on basis on how much their audiences in fact understood of their ramblings, I think they might consider slowing down. Our neighbours in the bus, an elderly American couple, gave up very quickly! 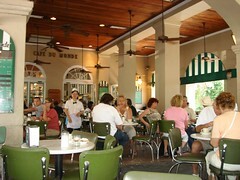 We started, as we’ve been told one should, with café au lait and Beignets at Café du Monde. For a food item that is clearly mass produced in that kitchen (they serve nothing else), they tasted surprisingly good. But they are not good for you!!! After having eaten a dozen very good oysters (8$!!!) 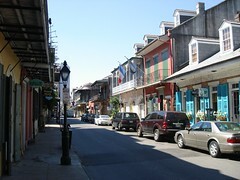 and Jambalaya, we headed to another part of town, Magazine Street. Nobody apparently ever bothers with the Street or Avenue part of the street names. It’s something like if we said H.C. Ørsted, everytime we mean H.C. Ørstedsvej. Or Oxford, when we mean Oxford Street. It’s that abb(reviation) thing again. Magazine is very, very long, like so many streets in this country. I don’t think I’ll ever get used to 5-digit house numbers! 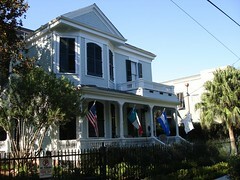 Almost all the way it is lined with detached or semi-detached houses in colonial style. Some of them so small that they look like doll houses. 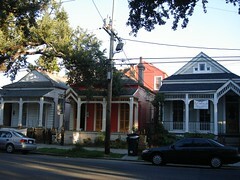 Either the new houses are built to look as replicas of the houses before them, or they just don’t build new houses. 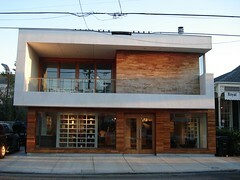 This house here is the only example of modern architecture we saw except for the highrises. It’s a pharmacy! At one point we came to the fire station. A couple of firemen were sitting about in front of the impressive truck. Dane and I went over to ask politely if we could take a picture of them. And being New Orleanians, they instantly invited Dane to sit there with them. And inside the truck to see everything. And even to sound the horn once! It’s my fault the picture isn’t better – I must have been almost as awe-struck as Dane was! There were several remarkable shops on the part of the street that we negotiated before nightfall. A lingerie shop with such a special atmosphere and a comfy sofa for the accompanying spouse with glossy magazines for men… And a combined barbershop, hairdresser, haberdashery and bar for men. Unfortunately David had just had a haircut a few hours earlier and he didn’t really need a shave… And there was the wonderful and mysterious shop that sold only flags and wind mobiles. The ancient owner told us that before Katrina, he’d hardly been able to make a living, and nobody really knew what the New Orleans flag looked like – or cared. But after – everybody wanted the flags for their balconies. And they wanted wind mobiles for joy – something it must have been very hard for a lot of people to find in the months after the storm. It’s been two years since Katrina – and she’s visible everywhere. Some places in the form of posters about rebuilding the city and being proud of her, other places you can just see the waterline. And to the east – mile after mile of devastation. And everywhere people are still talking about it. I would, too. While the last light faded, we watched some youngsters play basketball and football and then went to have a nice dinner. The taxidriver who was supposed to take us home, knew less about the city than we did. And his English was, eh, rudimentary. But with the help of a GPS and David’s pointing and directing we made it home to camp. Udgivet i september 22, 2007 Kategorier food, travel, usTags Louisiana, new orleans, rv, rving1 kommentar til Some city! After having done our washing in a laundromat (yet another first), we drove to a new campsite in Baton Rouge where I have more family! They had long known to expect the crazy Europeans and when we announced our arrival, they were quick to invite us to dinner. And not only dinner, no, homemade Gumbo! Mmmm, that was good! And I must say – what nice family I have over here! Keep’m comin’! The next morning we got up and away early for our much anticipated tour of the swamp. We decided to splash out here and charter a boat rather than sharing a ride with other tourists. That turned out to be a very good idea. Searched around on the web for a while and fell completely for this guy here, who’s love for the Atchafalaya basin is unrivaled. On the way there, we didn’t get lost once and made it on schedule (more on getting lost later…). We let our RV stand on a deserted parking lot and took off in Dean’s little boat. Wauw, it was fast! The swamp, the atmosphere, the sounds defy description. But it was breathtakingly beautiful and magic. Dean was a great guide – telling us about the history of the basin, the terribly many environmental issues that are facing the basin and wetlands generally and about the plants and animals that are invading the swamp and the ones who are extinct or threathened to be extinct. He knew the name of every bird, fish and insect we saw on the way. And – contrary to popular belief – there were no mosquitoes or horse flies or other despicable creatures – only insects we saw in the 2 1/2 hours we were on the water were – dragonflies. In all shapes and forms. 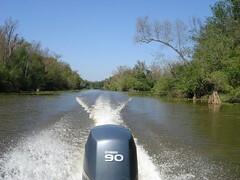 We didn’t see any alligators – Dean was sure he saw one at one point, but it went under when we came near it in the boat. He did show us the tracks on the river bank, though! However, I found the ancient cypresses much more fascinating than any alligator could ever be! After this fantastic experience, we drove on down towards New Orleans. Pronounced New ‘Orleans much to David’s dismay. And we got so, SO lost. The GPS wouldn’t accept the address given by the campsite, but we figured we could just follow their directions which seemed pretty straightforward. Well, guess what, they were’nt, or else (which is not totally unlikely…) we just got them all wrong. Downside was that we drove around New Orleans for hours. Upside was that we got to see with our own eyes, exactly what havoc Hurricane Kathrina really caused down here. In some of the poorer neighbourhoods we drove through, more than half the houses were left, empty. We probably wouldn’t have seen any of that, if we hadn’t got lost. Besides, we made people laugh. The people sitting in front of their little rickety houses knew that we were lost and grinned at us – but in a real friendly way! 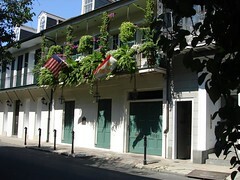 Tomorrow we’ll spend the entire day in The Big Easy. 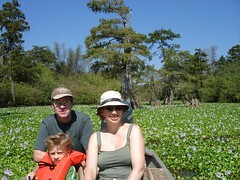 Udgivet i september 20, 2007 Kategorier travel, usTags family, Louisiana, new orleans, rv, rving, swamp1 kommentar til What a wonderful place! You notice right away that you’re in another state. I can’t quite put my finger on it, but it’s evident very quickly. Don’t know whether that’s going to be the case every time we cross a state border, but this time it was. For instance the casino billboards. None of those in Texas! And the condition of the roads. The I-10, which we’ve been on virtually all day, was absolutely awful for a good many miles. We could hardly communicate inside the RV, which rattles quite a lot even at the best of times. We’ve been half eating out, half self-catering since we came here. Allthough I just love a real American breakfast with sausages, pancakes etc., I’m so happy that we have a fair sized fridge and freezer, and that the supermarkets have such a fantastic selection of ripe and yummy fruit and veg, some of it even ready peeled and cut. Because otherwise I really don’t think I could avoid putting on weight! We discuss this every time we’re in a grocery store or in a restaurant or fastfood place. It’s almost impossible to buy things that are good for you! Take the above mentioned cut fruit in the supermarket. Half of it is sold with a bowl of caramel sauce or the like. Or the bread section – 3/4 of the bread isn’t really bread, it’s cake! Same with yoghurt – there are about 200 kinds with “fruit” (=more than 15% sugar) and 2-3 kinds of natural yoghurt – and one that’s also fat free. And in fastfood places, you’re punished if you want a bottle of water instead of a soft drink. The socalled Combos (Supersize Me!) include only huge glasses of coke, sprite or the like. Water is extra. Lots of things are sold with FAT FREE on the label. Fine, but it doesn’t say that it contains 40% sugar – and the reverse – things are sold as SUGAR FREE, and you have to read the small print to see how much fat there’s in it. It’s a really hard job to not put on weight here! Small wonder that it’s the poor and the uneducated who (mainly) suffer from obesity and all the related illnesses – it’s almost a science to shop healthy food that’s also affordable in the big grocery stores – particularly if you can’t, won’t or are unable to cook your own food and must rely on ready-made.